Jing Shuai’s aim behind Fan Your Talents is to create a fun and inviting space in which people of all ages and skill levels may come together and participate in a journey of self-discovery. The classes incorporate elements of Taoist philosophy which is seeking simplicity through the laws of nature as a way to help participants channel their inner creativity. 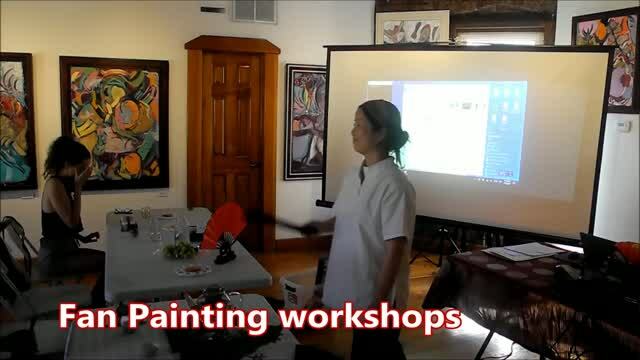 Anyone who is interested in exploring and nurturing their inner talents is invited to these workshops, and no previous art/painting skills are necessary. *Jing Shuai, is a 16th generation protégé to the ancient Chinese Wu Dang San Feng martial arts lineage, and a Tai Chi instructor who is certified by the Mainland China Martial Arts Association. Born in Szechuan, China, she was deeply influenced by the Chinese traditional fine arts. This project is one of her newest explorations, based on her Tao Tai Chi philosophy and her daily multi art form regimen. >>More Information about Jing Shuai.